Nurikabe puzzles are fun Japanese logic puzzles where the aim is to shade in certain empty squares to create a set of 'islands' of the given sizes. The rules need to be read carefully to start with, but once you are familiar with them they are very rewarding and due to their visual nature can be particularly intuitive to solve. 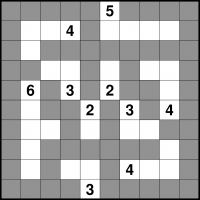 In a Nurikabe puzzle you start with a mostly-empty grid that contains some numbered squares. Shade in some squares so that every given number in the puzzle remains as part of a continuous unshaded area of the stated number of squares. There must be exactly one number per unshaded area (so no unshaded areas without numbers, and no unshaded areas with more than one number). Unshaded areas must have shaded squares or the edges of the puzzle around them on all sides - in other words, they cannot touch one another (except diagonally). A very important second rule is that shaded squares cannot form any solid 2x2 (or larger) areas. This is often key to solving the puzzles. Unshaded areas can be any shape you like. And finally a third important rule: all the shaded squares must form one single continuous area. In the example solved puzzle on the left, notice how each number is in its own, separate unshaded area of that given number of squares. Notice also how all of the shaded squares form a single area, so you can travel from any shaded square to any other, and that there are no 2x2 shaded areas. One of the nice things about Nurikabe is that there are various ways to think about solving a puzzle, all of which can help when you get stuck. You can look for 2x2 areas that can only be reached by one (or a limited number) of unshaded areas, or you can try growing areas from the existing numbers - or you can do the converse, growing regions that must be there to prevent a 2x2 shaded area but which you don't yet know the size of. Every Nurikabe puzzle only ever has one possible solution, and it can always be reached via reasonable logical deduction. In other words, guessing is never required. Nurikabe puzzles on puzzlemix appear at a wide range of sizes and difficulties, usually from 10x10 upwards. Are you searching for help with Nurikabe puzzles? Stuck on solving Nurikabe? Don't know the instructions for Nurikabe? Need Nurikabe instructions? Want solving hints and tips for Nurikabe? Then puzzlemix is the place for you to play Nurikabe puzzles online. Looking for printed Nurikabe puzzles? Visit Sudoku Xtra for puzzle magazines and books. Or are you looking for a Nurikabe puzzle supplier? If so then check out Any Puzzle Media, my puzzle production company.